Last night’s meeting of the Brooklyn Bridge Park’s Community Advisory Council ended with the passage, by an overwhelming majority, of a resolution proposed by Council member Judi Francis, requesting (1) full disclosure of the Park’s financials; (2) a new Environmental Impact Statement taking into account new data regarding the impact of housing proposed and under construction on Park land on local infrastructure, including schools, traffic, transit, health care, and flood preparedness; (3) a study to ensure that no more housing is built on Park land than is needed to fund Park operation and maintenance; and (4) a halt to all construction at Pierhouse it is determined that the structure (with remedial action if necessary) does not violate any views protected under the terms of the Park’s original Final Environmental Impact Statement. The CAC’s resolution has no immediate effect; it will go to the Park Corporation’s board of directors for consideration at a meeting scheduled for February 26. The meeting began with routine business, which included the news that two BHB contributors and friends, Matthew Parker and T.K. Small, will be leaving the CAC. Parker is moving to Pennsylvania, and will be missed by us here at BHB, as well as by users of the Hillside Dog Park. Small, who has represented the disability community, has recommended as his replacement Joan Peters, another advocate for the disabled. 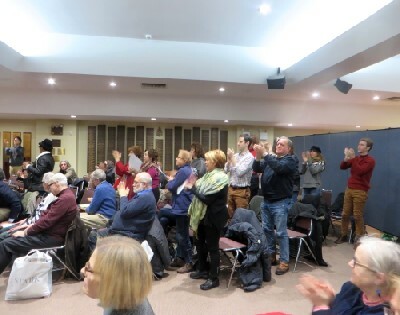 After some discussion of agenda items, members of the audience began demanding that the meeting proceed to discussion of the contested matters on the agenda, and co-chairs Andrew Lastowecky and Lucy Koteen agreed to do so, deferring other matters to the end of the meeting. The first presentation was by representatives of the P.S. 8 PTA, who used charts and graphs to demonstrate how that school’s situation had changed from 66% of capacity at the time the Park’s FEIS was issued to 148% of capacity today, and called for a new study to take into account the impact of Park housing on local schools. They also noted that there is considerable other new residential development taking place in the area that will further stress school capacity. Steven Guterman of Save The View Now then took the floor, with a visual presentation that included language quoted from the Request For Proposals to develop what became the Pierhouse site and from the Park’s FEIS that, he said, committed the Park and the developer of the site to preserving views of the Brooklyn Bridge from the Promenade. He also showed diagrams illustrating how changes in the plans for the site had affected views of the Bridge from the Promenade. He showed that initial plans for the site had limited the height of the northern part of the structure to 34 feet for a distance of 80 feet from its southern end, to afford views from Squibb Park. However, the Pierhouse as constructed has ignored this limitation, and by doing so has not only blocked the view from Squibb Park but has also affected views of the Bridge from the Promenade. His presentation drew a standing ovation form many of those present (Photo above). Park Corporation President Regina Myer described the progress the Park has made, noting that it is now nearly 90% complete, and that new sections on Pier 6, the Pier 5 uplands, and John Street are slated to open soon. She stressed the Park’s need for revenue to meet its exceptionally high operating and maintenance expenses, stemming largely from the fact that much of the Park is on piers supported by pilings that were set in place in the 1950s and ’60s, and which haven’t been maintained since then. She also said that the development of the Pierhouse design at each stage was presented to, and approved by, the CAC. Following Ms. Myer, David Lowin, the Park Corporation’s Vice President for Real Estate, gave a presentation, with visuals, showing the development of the Pierhouse design and noting that the placement of bulkheads on the roof had been done in a way to minimize the impact on the view of the Bridge from the Promenade. After the presentations and discussion involving members of the audience and CAC members, Ms. Francis presented her resolution, which then passed. CAC member Bill Orme expressed the opinion that the CAC, himself included, had been insufficiently diligent in considering the effects of changes in the Pierhouse design on views sought to be protected in the 2005/6 agreement that limited height to 100 feet. He said he believed throughout, including when it was disclosed, following Superstorm Sandy, that the building’s mechanicals would have to be relocated, that the 100 foot limit would be respected. Another CAC member, Doreen Gallo, disagreed with Mr. Orme. She said she did not think there was a failure of diligence on the part of the CAC, but that the CAC had not been given adequate information. Also see Tale of the Tweets below. Sad that they didn’t have time for public questions. I would have asked BBPDC “Why did you need to request a stop work order on Parcel B? If you you knew it was compliant you wouldn’t have to. If you didn’t know if it was compliant, why weren’t you paying attention until a public outcry occured, and why should be trust your judgement that the builders are compliant at Parcel a”? BBPC did not request a Stop Work Order. BBPC asked the Buildings Department to review the plans, which always triggers a ‘SWO.’ I suspect the development corp’ asked for the plan review fully expecting to get a clean bill of health, so to speak. The CAC can’t be held wholly responsible for the Pier 6 towers or the loss of the view. Until recently, several of the CAC members derived all or much of their income from the park. Even if this never influenced their votes and comments, it was highly inappropriate and a serious conflict of interest. (Note that I wrote “if.”) The CAC still has some conflicts of interest, but I hope that the tide is turning. If BHB readers want to continue the momentum from last Tuesday’s meeting, they should donate to Save the View and to People for Green Space. PS 8 will also suffer if the Pier 6 towers are built — along with the other megabuildings planned for Brooklyn. Attorneys and lawsuits are expensive, and the BBPDC has very deep pockets. The whole story about maintenance of the pilings is a exaggerated pile of BS. Any necessary remediation to the pilings, is done during the initial construction of the park. The measures taken are designed to last many many decades. No work can ever be done to the pilings underneath the piers as it is far to dangerous to have any person work there. I Know, because I have worked on pier related construction. Before park construction began, the Port Authority of NY & NJ committed $30 million (or so the agency claimed) to remediate some of the pier supports by encasing the wood pilings in concrete sleeves. If you look at the pilings of Piers 2, 5 and 6, you’ll see the work that was done. Check with the BBP office whether the Pier 3 work has been completed; I saw a diver descending into the water as late as last November. The work is obviously dangerous and requires extraordinary operational and safety measures as well as highly trained individuals, that’s why ii’s so costly. If you’ve worked on pier-related construction, you’d also know that piers require continuing attention. If the piing work has already been done, why is the BBPC asking for more money to do it again? Just more BS from RiGina. Throw her out, put her in jail. Brooklyn needs justice. I am still getting my head around the fact, according to a report in The Wall Street Journal, that from May to August last year, 4.5 million people used BBP. That’s ten times as many as the BBP originally hoped to attract annually. I wonder how people who buy apartments at Pierhouse will appreciate the sea of humanity just outside their windows. In numbers of visitors, BBP has certainly exceeded expectations. BUT — how do they arrive at this number? When the red tourist buses go into the park, do they count every bus as a full bus, which I guess would be c. 50 people? Or more? With so many visitors, don’t we need more open green space, not more brick and mortar? And more brick and mortar and asphalt equals less soil that can absorb water in case of another storm or hurricane. Can astroturf absorb floodwaters? Bklyn20, I have seen the people with their counters who stand at the entrances and count the visitors. Any visitor who wandered in and out of the various sections in DUMBO, Fulton Ferry Historic District, the Piers, would likely be tallied by multiple counters. But the crowds are real, and I have no idea what a good correction factor would be! The divers can only work on the perimeter pilings. It is far too dangerous to send anyone under the pier due to fact that waves would smash them into the pilings. The BBP has never produced a detailed budget of the exorbitant maintenance they claim makes condo development necessary. The whole Park is just an excuse to for developers to exploit the waterfront, not the other way around. Anyone who believes otherwise is a fool. Thanks for reporting on the meeting. I think it unfair that you did not also include the excellent presentation from the PS8 parents as an attachment. All these issues – serious school overcrowding, the violation of view planes, the park financials showing that it is now more than fully funded without new buildings – are of one, whole piece and all presentations should be posted for those who couldn’t come to the meeting. Thks. in advance. And yes, we needed far more time to hear from park users and residents as this is YOUR park. That is why the Chairs took the unusual and needed step to have an unplanned follow up meeting on March 3rd. Hopefully you will come out and ask more questions. Really, thanks all for your engagement. Real truth here. The park was a scam from the start. Response the well knew it would cause. But what are you now all going to do about it?